The International Committee of the Red Cross's study of Customary International Humanitarian Law by Jean-Marie Henckaerts and Louise Doswald-Beck (Cambridge, 2005) contains a unique collection of evidence of the practice of States and non-State actors in the field of international humanitarian law, together with the authors' assessment of that practice and their compilation of rules of customary law based on that assessment. The study invites comment on its compilation of rules. 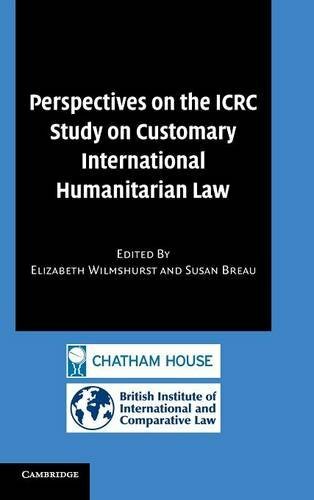 Perspectives on the ICRC Study on Customary International Humanitarian Law results from a year-long examination of the study by a group of military lawyers, academics and practitioners, all with experience in international humanitarian law. The book discusses the study, its methodology and its rules and provides a critical analysis of them. It adds its own contribution to scholarship on the interpretation and application of international humanitarian law. This book discusses the study of Customary International Humanitarian Law (Cambridge, 2005) and analyses the law relating to such matters as targeting, prisoners of war, weapons, war crimes and the protection of the environment during conflicts.